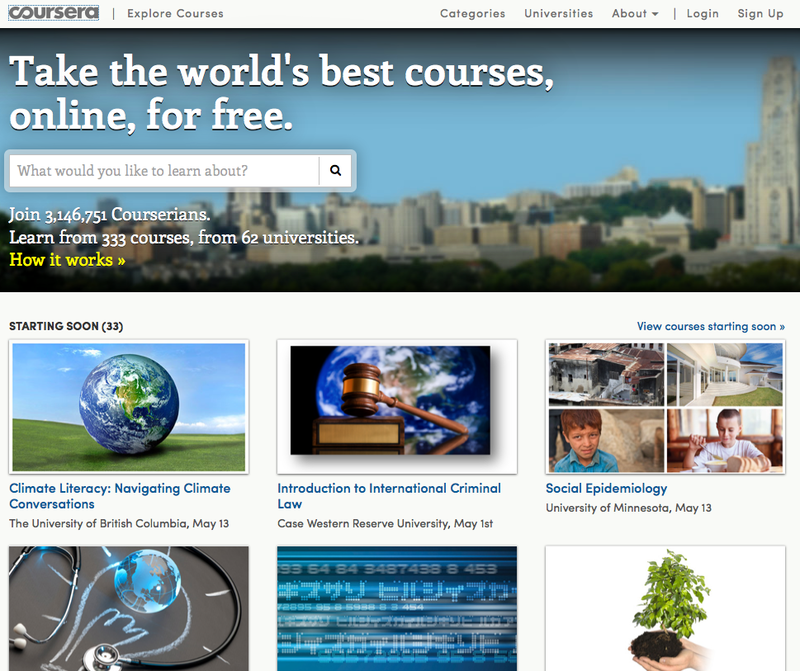 A new model of univeristy, online and free for everyone: Coursera. The future will offer top university courses not only to the lucky and select few, but to millions of students round the world. Current technology allows the top-notch professors in the world, to reach students connected from any point in the world. Making education available for all will empower people to improve their lives, the lives of their families, and the communities they live in. Coursera offers a microformation and online model of education. With courses in current, powerful and impactful topics that will allow students to master their contents. The courses offered range in a wide varity of topics: Humanities, Medicine, Biology, Social Sciences, Mathematics, Business, Computer Science, and many others. Students will be able to follow as many courses as they desire, and create their own curriculum. The courses are interactive and they include lectures and exercises, students will watch the courses from anywhere in the world advancing at their own pace. The courses will monitor every student´s progress and will allow them to master their selected topic. Every student upon joining a course, will also join a world community of people learning along side with them. This entry was posted on April 2, 2013 by mcquant in News, Uncategorized and tagged Learning, Online Learning, Technology, University.